One of my earlier cookbooks, The Garden of Vegan by Tanya Barnard and Sarah Kramer. You can see what else I have blogged from this cookbook here. Apple Streusel Muffins: If you promise me streusel topping, I want streusel topping. So I scaled up the streusel ingredients from 2TBS sugar as a base to 3TBS. Sprinkle about 1/4 tsp on top of each muffin, and you have a nice, crunchy, sweet topping. Again, I assume they made theirs in a big muffin tin, as I got 12 muffins instead of 6. Nana Marg's Bran Muffin Mix in a Jar: This quick mix gives you enough for three batches of muffins, though a note it does need to be stored in the fridge. I scaled down for one batch of muffins. 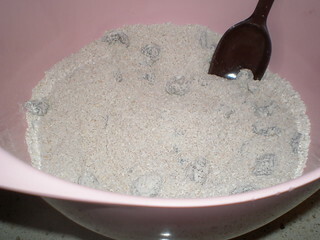 It is an equal mix of bran and flour, with cinnamon and other spices and raisins. 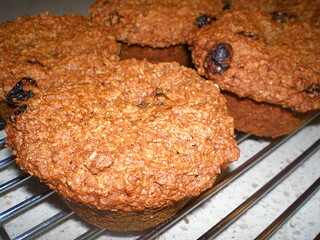 Nana Marg's Quick Mix Bran Muffins: Take the above mix, make into muffins. The recipe does involve a mashed banana, apple sauce, oil, and water to be added. I did make 6 muffins with this one, but it filled my regular muffin cups right to the very top and they ended up very big! They are also quite substantial. Now that I write this, maybe the others were made in normal sized muffin tins, they just make them so they overflow when baking for big muffin tops. 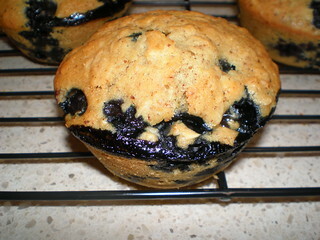 Blueberry Muffins: This is turning into quite the muffin edition! Though this is the last muffin for this round-up. 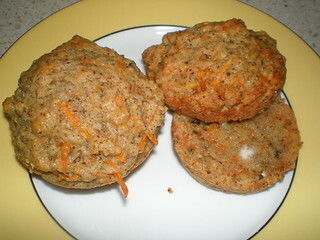 These muffins also have rolled oats in them to make them a little more substantial. 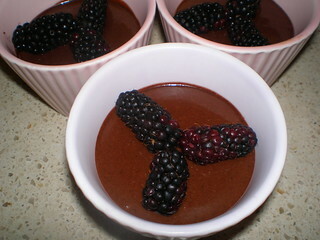 I used frozen blueberries, I almost always use frozen berries for these sorts of things. I made this 6 muffin recipe into 10 'normal' (or maybe snack would be the better word) sized muffins. 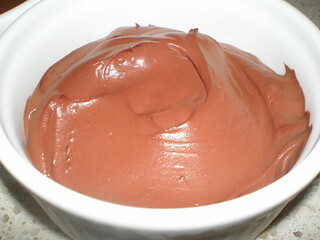 The Most Amazing Chocolate Pudding: This pudding is based on silken tofu, though uses cocoa powder, sugar and olive oil rather than chocolate chips to bring the chocolate. The olive oil was just noticeable, but gave a nice flavour. It is great with some fresh berries. Chocolate Mint Mousse: Chocolate and mint are not so much my thing, but this one was pretty good. It falls into the silken tofu and melted chocolate category of mousses, and as such was very thick. I used the lesser amount of the mint extract, and also added some maple syrup to mellow it out. Dim Sim had her surgery on Tuesday and came home on Wednesday morning. She slept so hard!!! 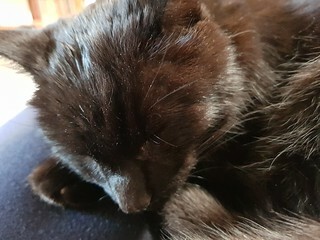 And wanted to spend a lot of that sleeping time on my lap. She is the sweetest. She seems to be dealing well with recovery, still a bit wobbly, but otherwise her normal happy self and not bothering at her stitches. Hopefully we will get the results back this afternoon, and hopefully they will say all clear! I'm so glad Dim Sim is back in your lap! I hope the results are clear, fingers and toes crossed! She is way braver than I am! 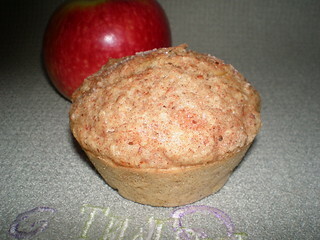 I use to make those apple streusel muffins all the time! All that mousse makes me think of a cool technique from the Great British Baking Show- the one guy just melted chocolate, added water, the whipped it making an all chocolate mousse! I have never seen the GBBO, and I really want to. It seems so much fun. Clearly it isn't vegan but it is very fun to watch if you like baking. I think the only thing that I dislike are the savory pie challenges. Always meat, and since I did't grow up eating them, they never looked cooked.